America in the 1950s was a pretty crazy time. It was the height of the Cold War and the nuclear arms race between the United States and the Soviet Union was ramping up. The American counter culture was taking root within the cities, driven by writers, poets, artists and musicians. Television was dramatically transforming the way people were informed and entertained. And fear of communism had gripped Washington so tightly that it ignited one of the single biggest witch hunts in all of history, personified by Senator Joseph McCarthy and the House Committee on Un-American Activities. However, as far as we know, there weren’t any large, talking animals writing hit plays on Broadway. But really, considering everything that’s happened since then, would it have really been all that strange? Certainly not to artist Mike Feehan and his collaborator Mark Russell (THE FLINTSTONES), the team behind EXIT STAGE LEFT: THE SNAGGLEPUSS CHRONICLES, a new six-issue miniseries that reimagines the sly, theater-loving pink panther as a gay Tennessee Williams-like playwright who gets enveloped by the Red Scare in Washington. The first issue of this thought-provoking and undeniably timely new comic hits stands in January, but we thought we’d give you a sneak peek at it right now. In addition we spoke with Feehan about bringing the familiar and yet strange world of Exit Stage Left to life, including how he adapted the look of Snagglepuss for a modern audience, what it’s like collaborating with Russell and what sort of view Canadians take of the circus that is American politics. So, would you call yourself a cat person? I like cats but I don't know if I'd call myself a cat person. I own a cat, he's great with me but he's a total monster to everyone else, so I'd rather not be publicly associated with him. My dog is perfect though, I'd much rather be called a dog person. This is your first major comic book project. How exactly did this come about for you? The short version of the story is that I went to a portfolio review at Fan Expo Canada and met with DC editor Jim Chadwick. Jim showed my work to Marie Javins after the convention and later that week Marie asked me to try out for the book. The longer version of the story is that I had been going to portfolio reviews, working on pitches and emailing editors for about 7 years by that point. Prior to this I'd been working as an illustrator, graphic designer and commercial storyboard artist, but it's always been my dream to work in comics. Every year I'd update my portfolio and hit up some conventions and this year it finally paid off! The world of The Snagglepuss Chronicles is pretty hyper-realistic, except for the fact that it has large, anthropomorphized animals living within human society, including our protagonist, who’s bright pink. Was it hard finding that balance? I think that the 1950's setting really helps with that. It's impossible to make human-sized animals walking around New York City look totally normal, but I've been finding that they don't seem so out-of-place when set against the fashion/cars/advertising of the 50s. What Paul Mounts is doing with the colors has been a big part of that too. The bright, poppy look of that era is a perfect fit for a giant pink cat. How did you go about deciding on the look of Snagglepuss and other characters like Huckleberry Hound for this series? When I was brought on board, the incredible covers by Ben Caldwell and Evan Shaner for issue #1 had already been completed, so their depictions of the character definitely pushed me in a certain direction. I also spent a long time looking at pictures of mountain lions on the internet, trying to figure out how their faces worked. I drew about 60 sketches of Snagglepuss before I sent my top three to Marie for approval. It's a similar process for every character—I have photos of dogs, cats, hippos, etc. all over my desktop. How familiar were you with the Snagglepuss cartoon before you started on the series? I had watched reruns as a kid. There was a channel in Canada that played a lot of classic Hanna-Barbera cartoons, so his look and his famous voice were always something that I remembered. I find it amazing that every time I mention to someone that I'm working on this book, they're able to do a Snagglepuss impression. Even though he hasn't been on TV in a long time, there's still something about him that sticks with people. You’re working with Mark Russell on this, who has quickly built a reputation as a master of modern satire. How has the collaboration process been with him? When this book was first announced at the beginning of 2017, I thought it sounded incredible—I never would have guessed that I'd end up working on it. Mark's take on the Flintstones was one of my favorite comics last year and I'm very excited about having the opportunity to work with him on this. He has a vision for this book that I'm doing my best to execute and he's provided me with a bunch of references for people, fashion, ads, etc. This book is a blast to work on. 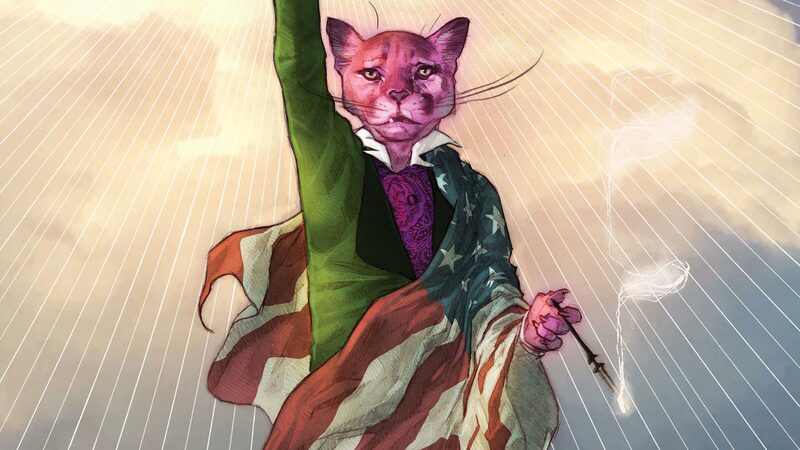 You’re Canadian, but The Snagglepuss Chronicles deals with a very distinct moment in American history. What’s it like reading and drawing all of this as an outsider? I think that most Canadians pay close attention to what goes on in the U.S., especially today. It's hard to escape a discussion about American politics no matter where you go, even if it doesn't directly impact us. On top of that, I think that most creators, or anyone who enjoys art in any form, looks at what happened during the era of the House Un-American Activities Committee as a nightmare. While reading Mark's scripts and researching more about what went on during that time, it was hard not to see some disturbing similarities to what's going on in politics and in society today, and I think it's important to be very aware of that. EXIT STAGE LEFT: THE SNAGGLEPUSS CHRONICLES #1 by Mark Russell, Mike Feehan, Mark Morales and Paul Mounts is in stores on January 3, 2018. For more on the series, check out Mark Russell’s interview with The Hollywood Reporter.